When I was in hospital nearly three years ago there was a time when I was close to death and comatose for some days. The first thing that I remember when I regained consciousness was of my wife sitting next to the bed and stroking my arm. During all the time that I was unconscious her love was with me, reaching out to me and embracing me. At that time in my life I couldn’t try to earn it or deserve it or even respond to it. It was just there flowing out from her to my spirit and waiting patiently for the time when I would become aware and consciously receive it again. So it is with the love of God for each one of us. It flows from Him to us because He loves us. It does not stop, it will not stop and it cannot stop. It is so powerful that no one and nothing can divert it or bring it to an end. Whether we respond fully, partially or barely does not affect it – it just keeps coming. And it always will. 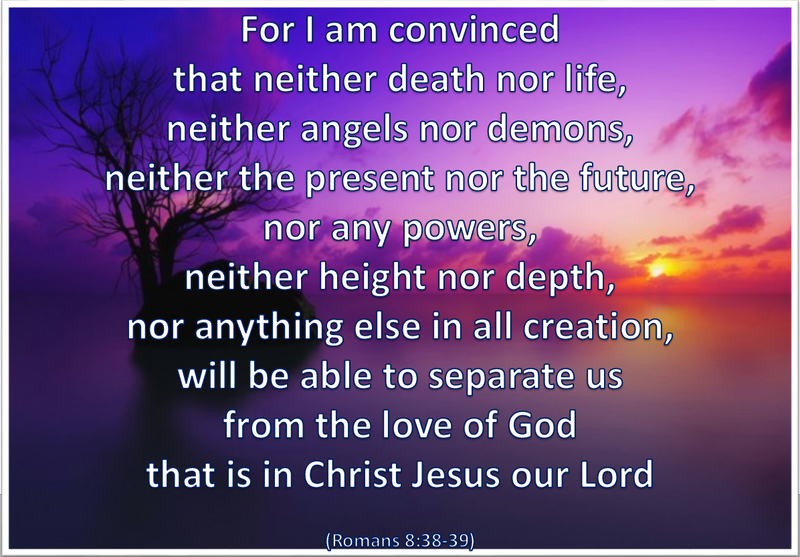 God’s love for us is unconditional, unlimited and unrestricted. It is a love that went to the cross for us and then walked out of the tomb again. Not even death itself could overcome it – instead it laughed at death and walked on to eternity. Thank You Father for Your wonderful and inextinguishable love. Please help me to know it, respond to it and live it at all times. Amen. Categories: Christianity, Daily Life, God | Tags: Daily Bread, Grace, Jesus, Lent, Love, Romans, Scripture | Permalink.